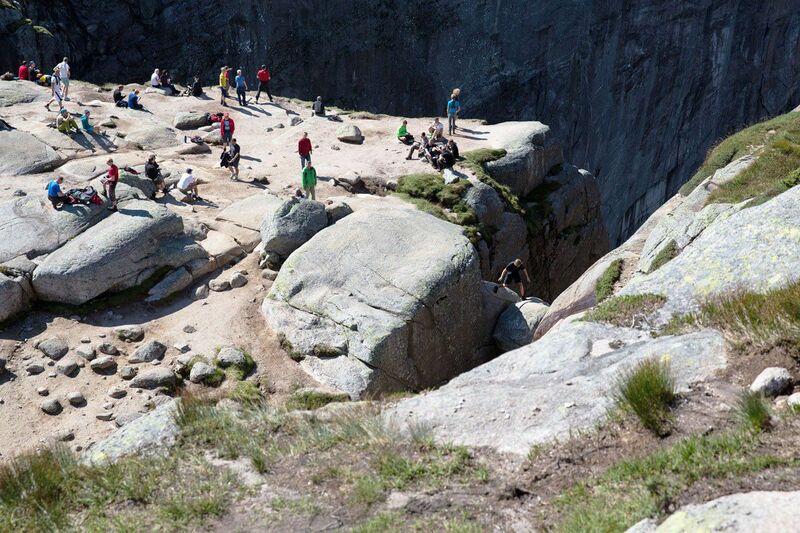 The Kjeragbolten hike is one of the most spectacular hikes in the world. 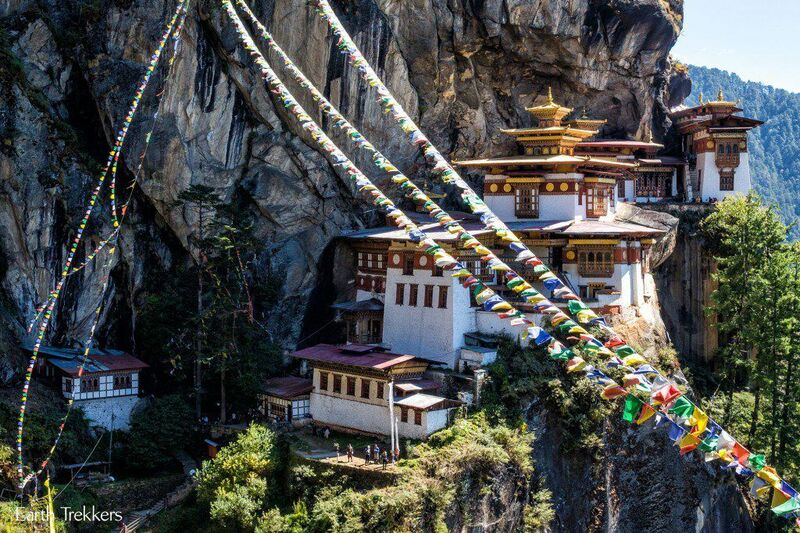 We have hiked on some amazing trails around the globe, in countries like Australia, South Africa, China, and Nepal. 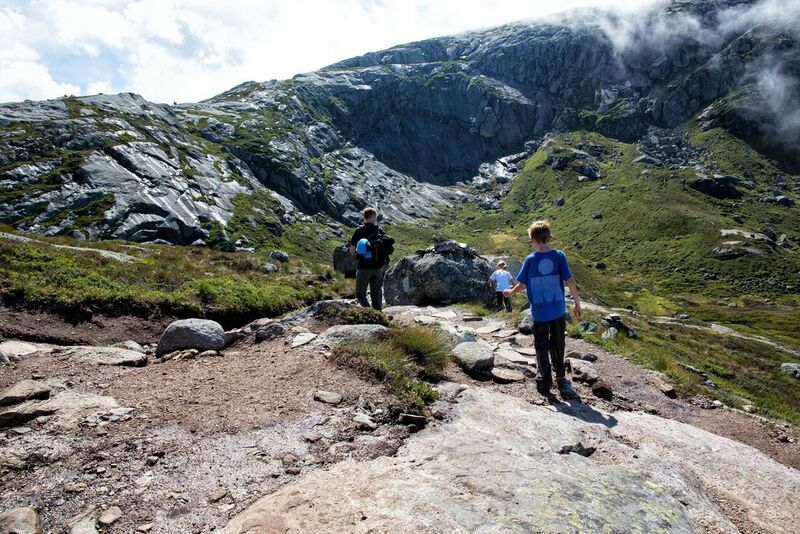 The four of us agree that the Kjeragbolten hike is still our favorite in the world. To read about our 10 favorite hikes in the world, read this post: 10 Best Day Hikes in the World. 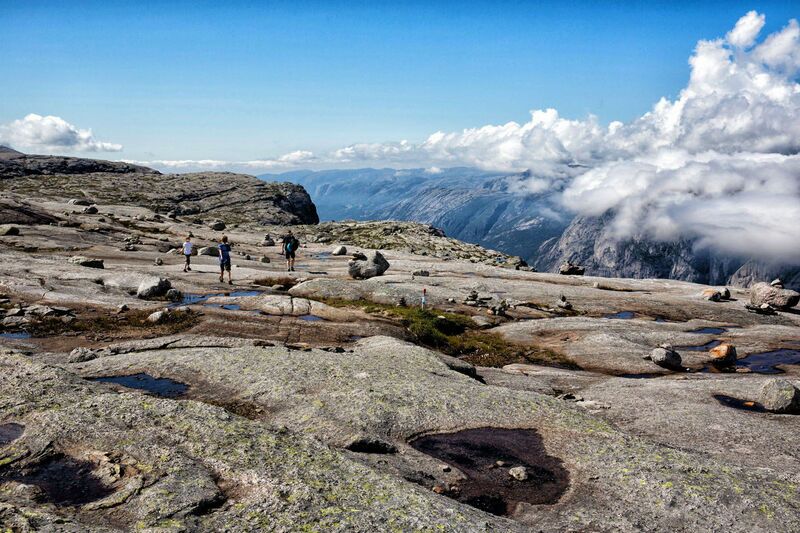 If you are traveling to Norway and enjoy hiking, put Kjeragbolten at the top of your list! 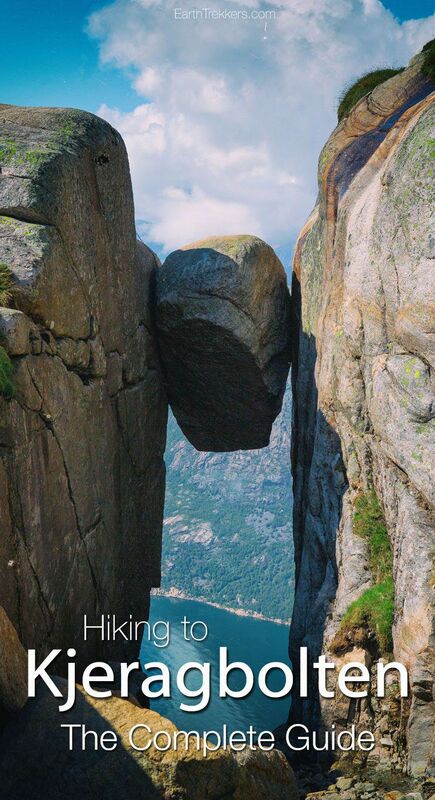 Kjeragbolten is located in southern Norway. The closest town is Lysebotn, just 15 minutes away by car. 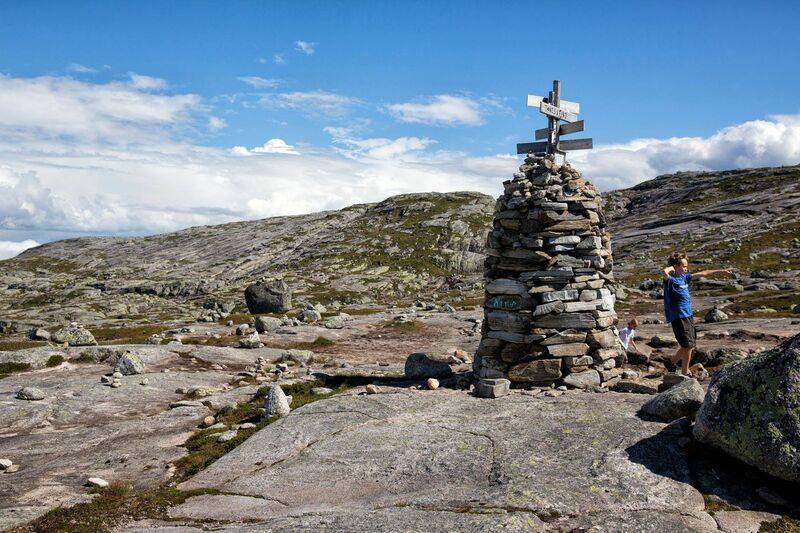 From Oslo, you can fly to Stavanger and then drive to the start of the Kjeragbolten hike. From Oslo, you can also drive to Lysebotn, a 500 km journey that takes 7.5 hours. 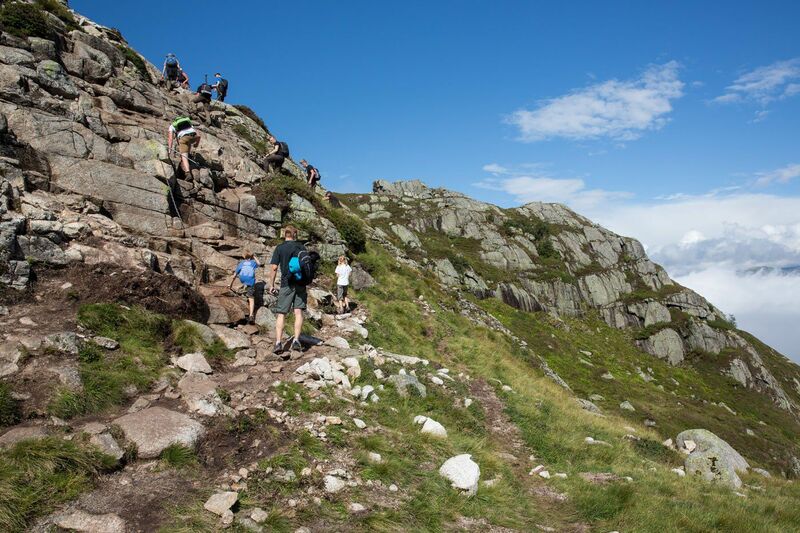 Most people stay in Stavanger in order to do this hike. It is a two and a half hour drive between Stavanger and the car park. 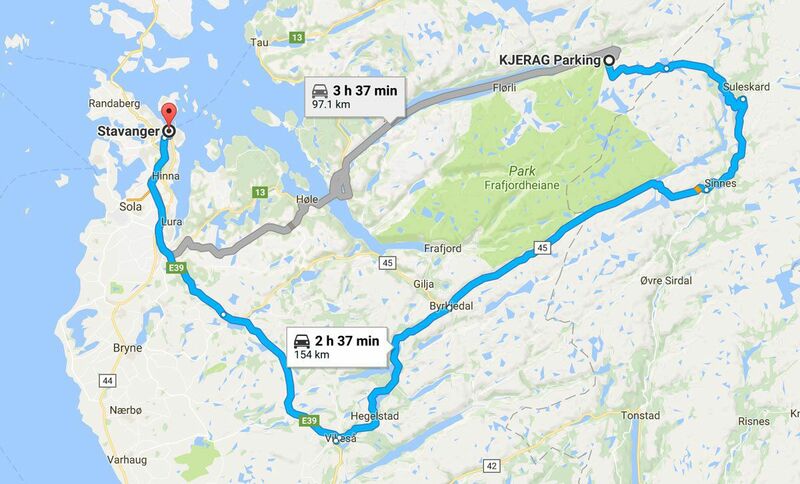 It’s a very scenic drive and you do not need to take a ferry on this route. Øygardstøl is the starting point of the hike. There is a car park (the fee is 200 NOK), bathrooms, and a restaurant here. 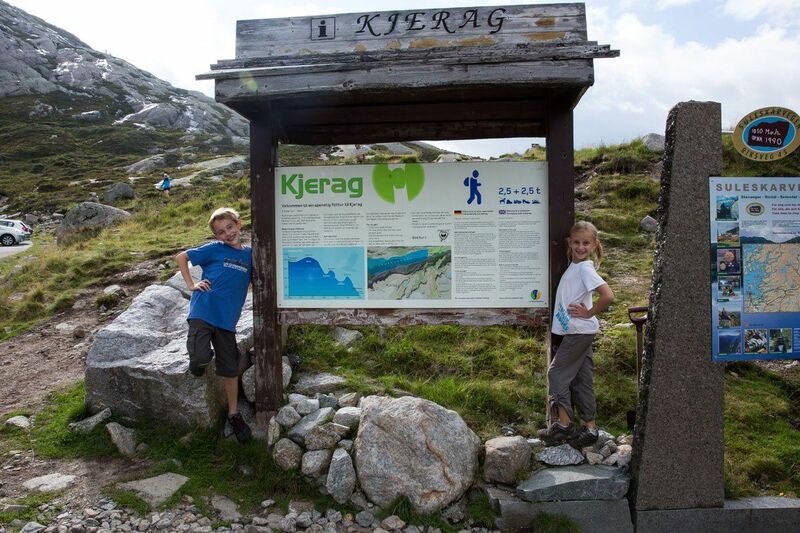 To find the start of the hike, put “Kjerag parking” into Google maps. 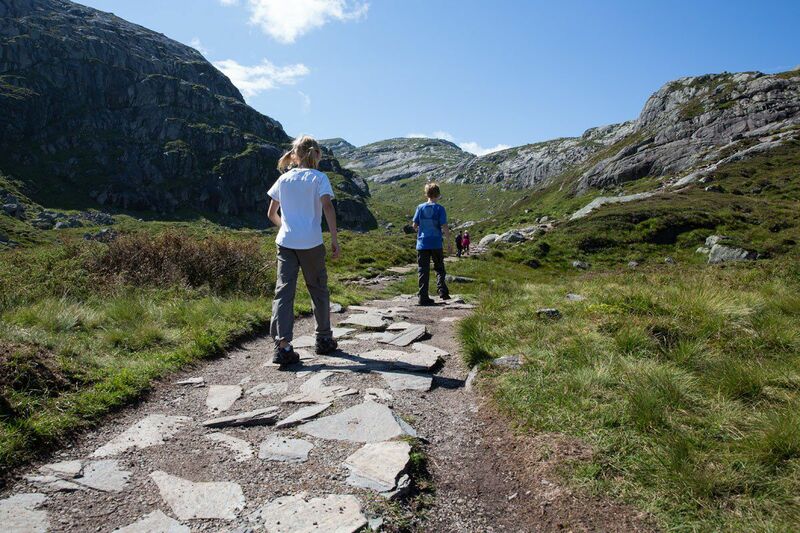 For those without a car, you can take a bus from Stavanger to the start of Kjeragbolten hike (from May 31 to September 28). The entire round trip journey takes 12 hours and ticket prices start at 640 NOK. 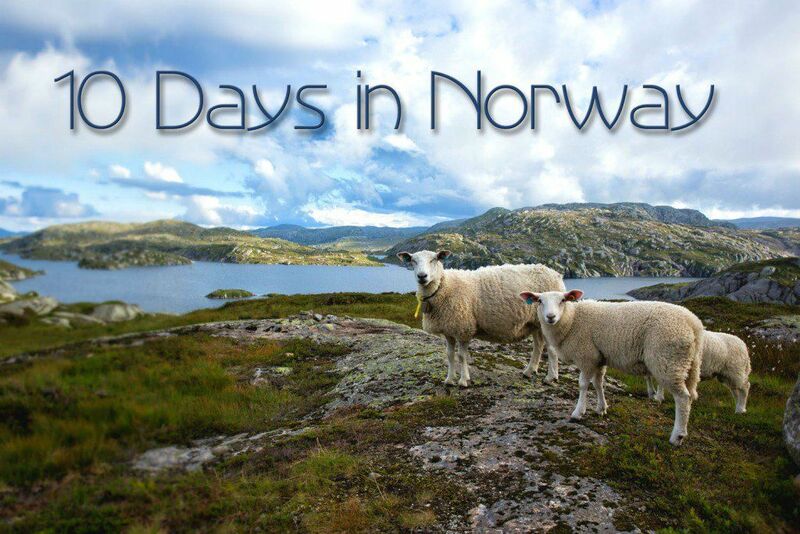 See the Visit Norway site for more information. The hike should be attempted only during the summer months, between June 1 and September 30. During the winter months the road is closed due to snow and the hike can be dangerous. Snow can cover the roads and the trails through the end of May. 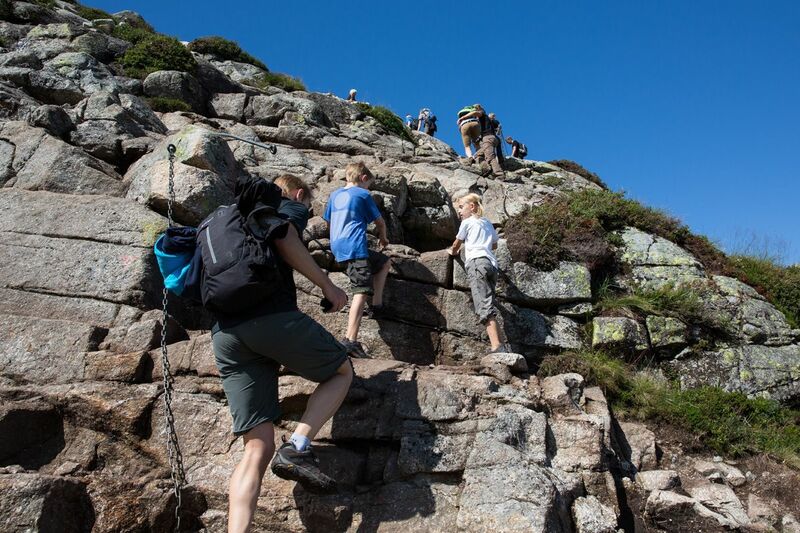 The distance of the Kjeragbolten hike is 12 km with 570 meters of climbing. Allow 6 to 8 hours to make the entire journey, round trip. If you are a fast hiker, it is possible to beat that 6 hour time estimate. It took us six and a half hours to complete the hike and this includes the wait time to take our photos of Kjerag. Any person with “reasonable fitness.” It’s not a long hike but there are three rather steep, strenuous climbs. No technical climbing skills are necessary, just a sense of adventure. There are chains in the steeper sections (see the photos below) to assist hikers. Beware, when it is wet, the climbs and descents can be slippery! 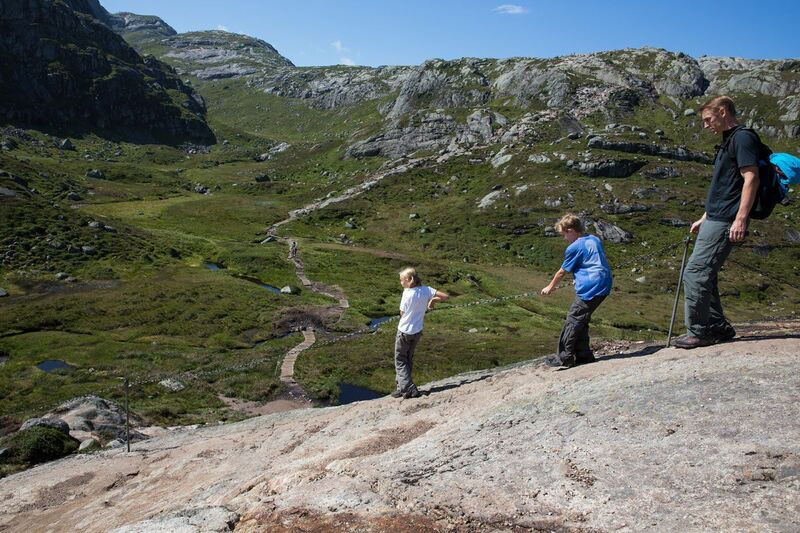 Yes, kids can do this hike! 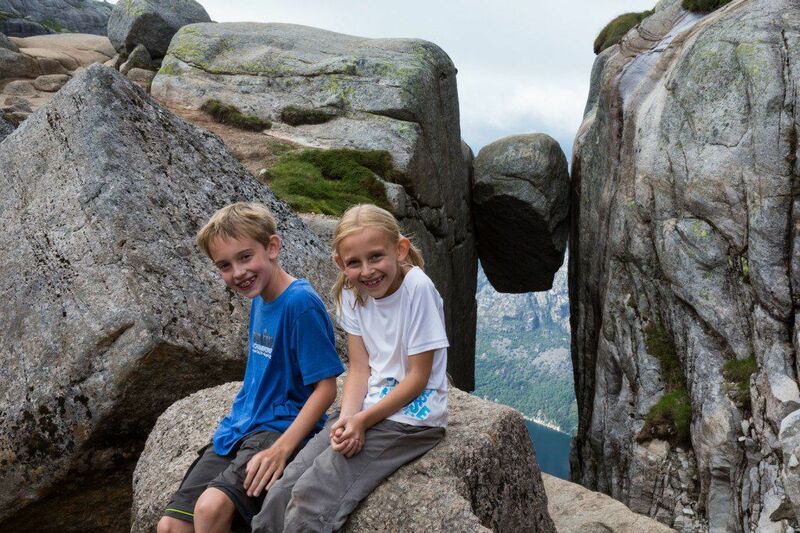 When we hiked to Kjeragbolten, Tyler was 10 years old and Kara was a few weeks away from turning 9 years old. They loved this hike. This was their first hike using chains and they thought it was pure fun. There was one very steep section where we had to give them a boost but other than that they did the hike without assistance. We did not allow Tyler and Kara to step out onto the boulder, that was for crazy parents only! Children 9 years and older, who are very active and adventurous and have prior hiking experience, should be able to do this hike. And now here are those photos I promised you. The Kjeragbolten hike is gorgeous. 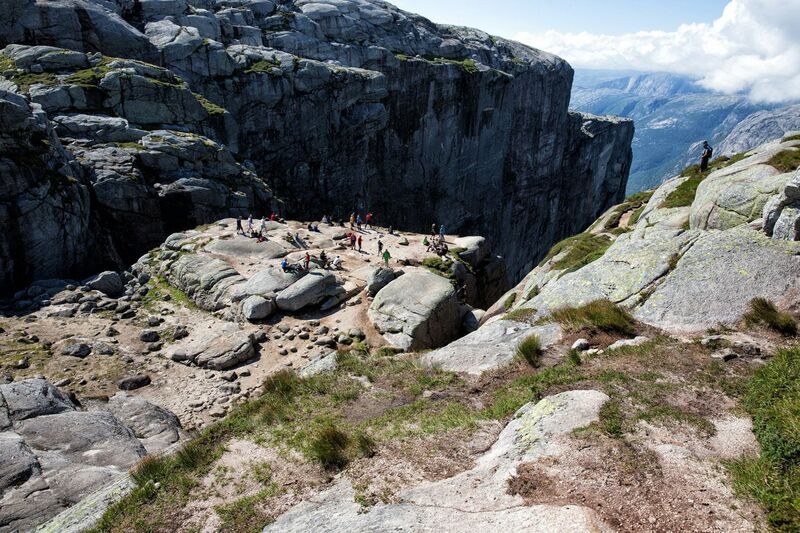 In fact, it is worth doing this hike even if you have no plans to step out onto Kjerag. From the carpark, you immediately start your first climb. This is one of the most difficult sections, so if you can get to the top of the first section you should have no trouble completing the hike. It was raining when we arrived but luckily the clouds moved out just before we started the hike. The ground was wet and very slippery! This hike would be very difficult, if not dangerous, to do in rainy, foggy conditions. This is the view from the top of the first climb. 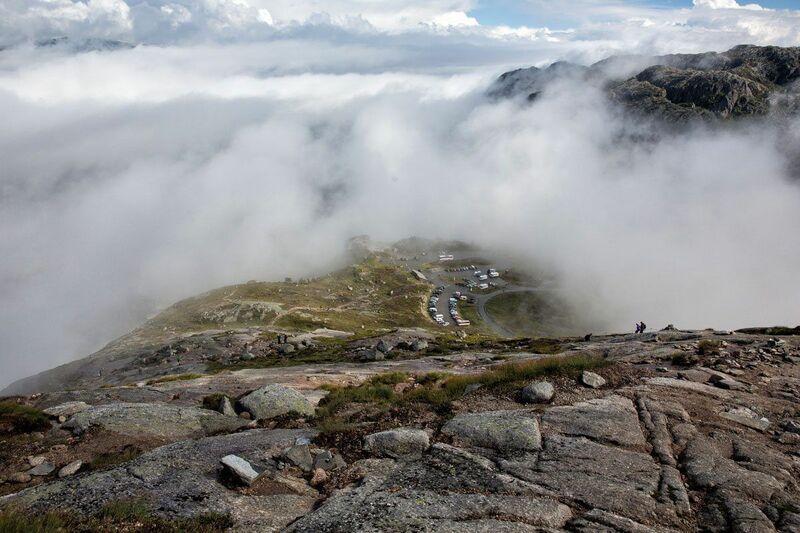 You can see the Øygardstøl carpark down below and clouds that were slowly dissipating. Continue the journey a little farther. This is the view of the first climb down and the green, wide valley. Another view descending down into the valley. You can see the trail snaking across the valley and then up the hill for the second climb of the hike. Now we are down in the valley with the second climb in front of us. We saw some sheep here, munching on the grass, their bells clanging as they walked around. This place is awesome! The second climb of the hike is the shortest but the steepest. This is the section where you will have to do some rock scrambling and use more chains. We had to give Tyler and Kara a boost up here but on the return journey they scrambled down on their own. A closer view of the steepest section of the Kjeragbolten hike. From the top of the second climb, this is the view back down into the valley. 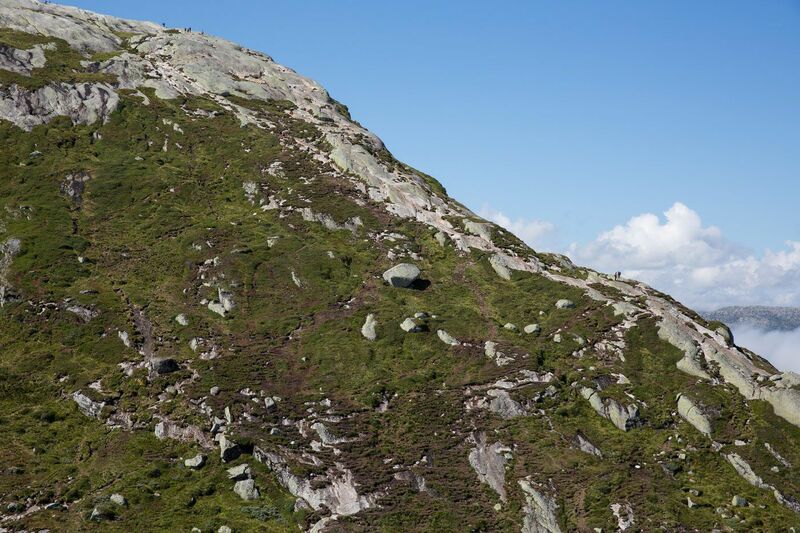 The trail climbs up the small ridge in the center of the photo and then disappears down the other side, where the car park is. Now that most of the clouds have cleared away you can see the real beauty of this place. And then, here it is, the final climb of the Kjeragbolten hike. If you look closely, you can see tiny people on the trail. This is the longest climb of the hike but once you are at the top the views are unbelievable! From the bottom, this is a look up at the final, long climb. Yes, those tiny specks are hikers. Once you get to the top, the terrain levels out, and it is like you are walking on the top of the world. Now it is series of smaller climbs and descents until you get to Kjeragbolten. Another view from the top of the world. It’s worth doing this hike just to see this! Along the way are signs posted, pointing hikers in the direction of Kjeragbolten. You can also follow the red T’s on the ground. Here is a closer view. 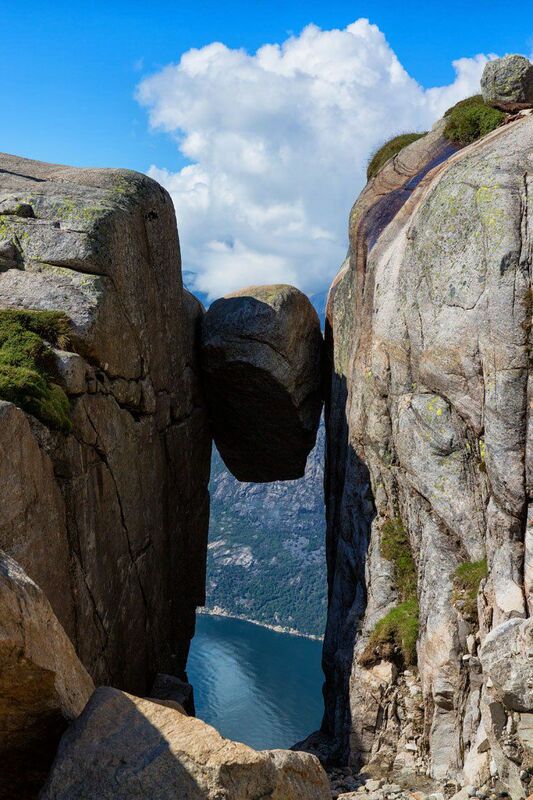 You can see a person stepping out onto Kjerag. 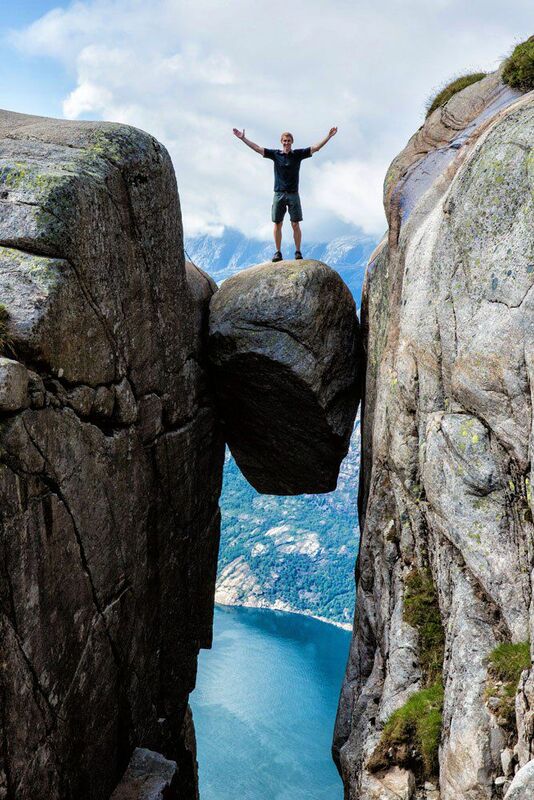 Here is Kjerag…do you dare? This is a view looking at the back of Kjerag, another crazy person posing for a photo, a lady waiting her turn, and Tim taking video of 1000 meters of empty space below the boulder. 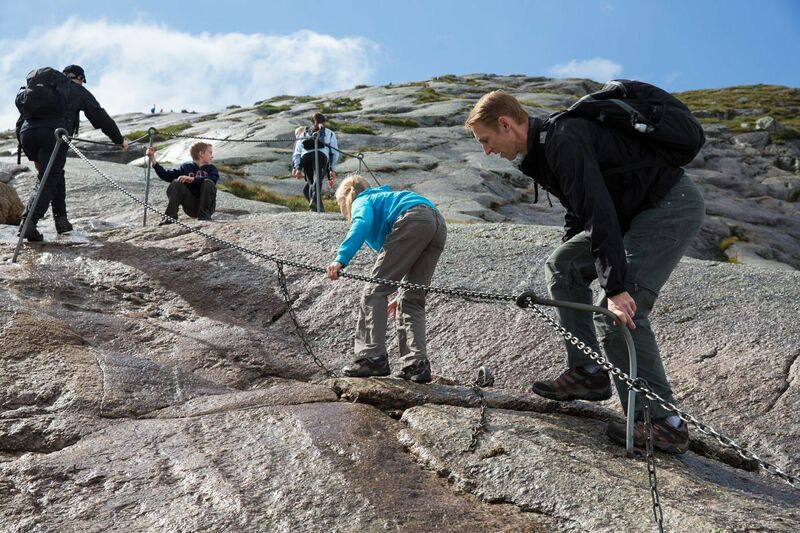 There is a chain lying on the ground to help you step out onto Kjerag but it almost seemed more dangerous bending over to grab it than just stepping out onto the boulder unassisted. The top of Kjerag seemed larger in real life than how it looks in photos. What was it like stepping out onto Kjeragbolten? 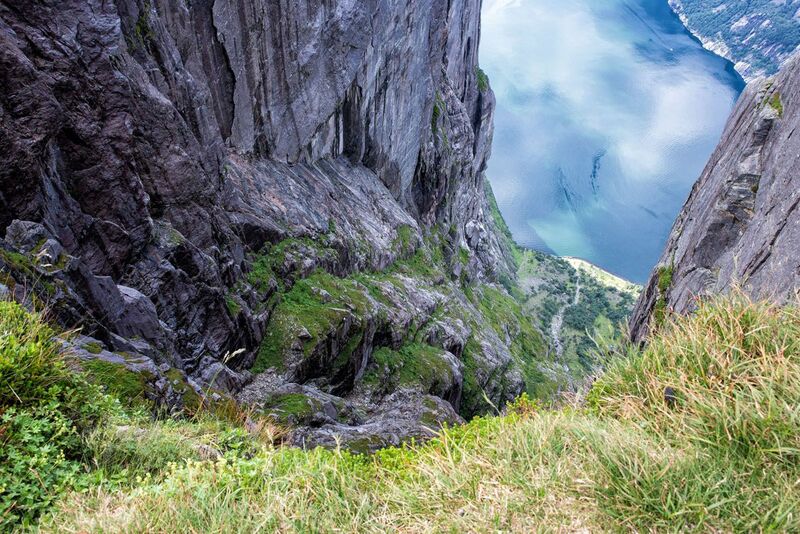 It was scary, knowing that one misstep could send me plunging into Lysefjord far below. 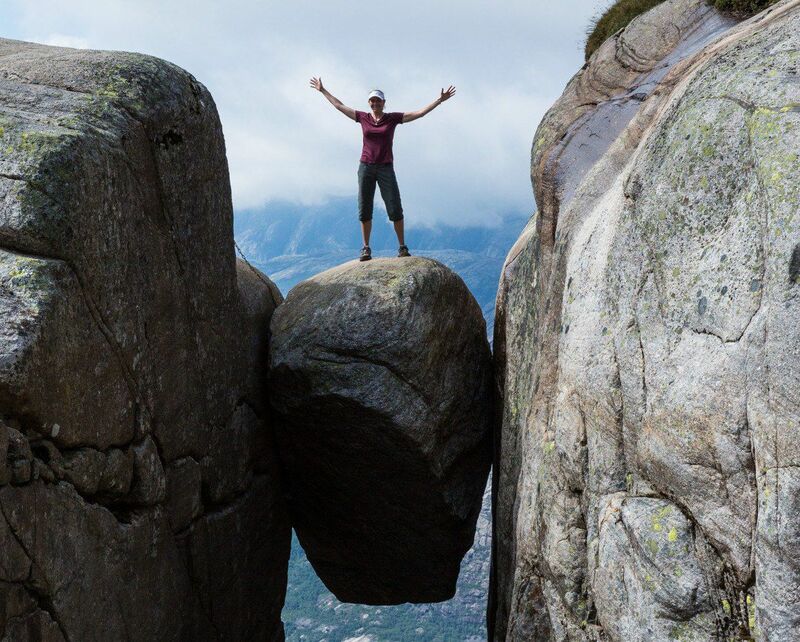 Yes, it’s crazy, but isn’t that the appeal of Kjeragbolten? While you are waiting, this is your view looking down at Lysefjord. After you smile for the camera, getting those photos that you will cherish forever, it’s time to hike back to the car park. 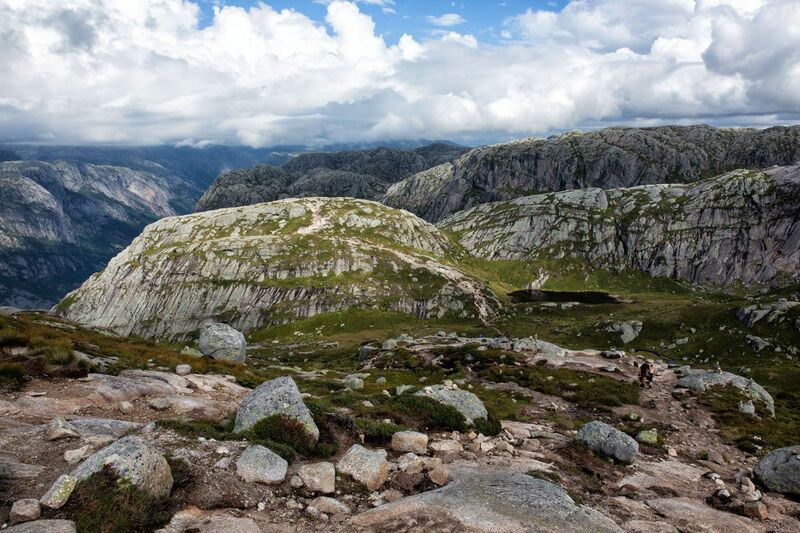 You will follow the same route that got you to Kjerag. This is a view down the first descent, the same spot as the final climb to Kjeragbolten. Lysebotn is in the valley far, far below. By the time we got back to the car park, our legs were exhausted from the constant descending. But we had two happy kiddos who were amazing on the trail. The restaurant is a convenient spot to grab a bite to eat or get some ice cream…well-deserved after this hike! If you have your own car, it is worth driving down to Lysefjord. This is a crazy road!! It rapidly descends 1000 meters and the road is a constant series of hairpin turns. It doesn’t take long to drive it and it was something we thought was cool to do. Hike to Pulpit Rock. 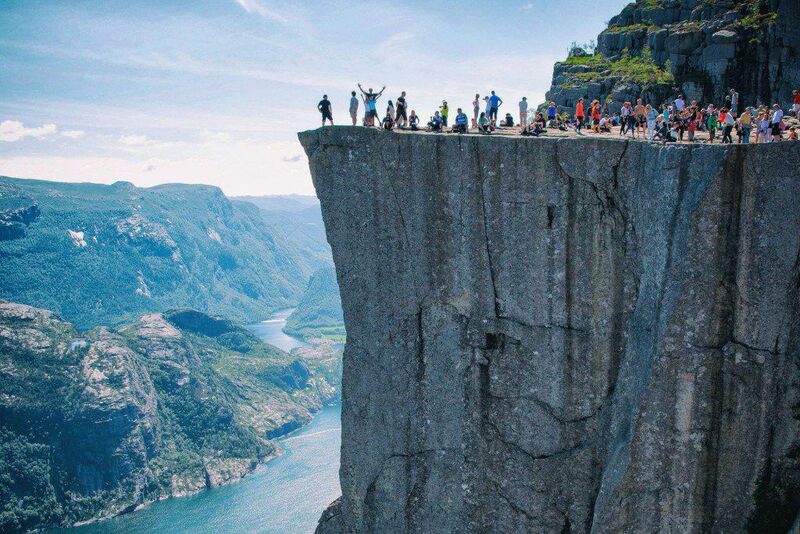 Preikestolen, also known as Pulpit Rock, sits across from Kjeragbolten on Lysefjord. It’s easy to get here from Stavanger but from Lysebotn you can take the car ferry across the Lysefjord and then drive up to the hike. Pulpit Rock is much shorter and easier than Kjeragbolten. It’s also a lot more crowded. 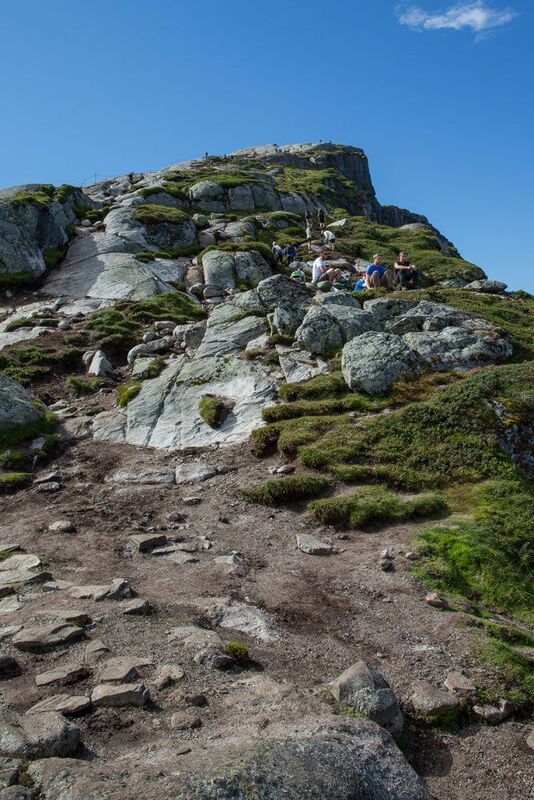 If you only have time for one hike, skip Pulpit Rock and do the Kjeragbolten hike. Good hiking shoes, lots of water, and enough food to fuel you for six to eight hours of hiking. And don’t forget your camera!! This is very important. The weather can change quickly and this is a hike that you do not want to be attempting in rainy, foggy weather. 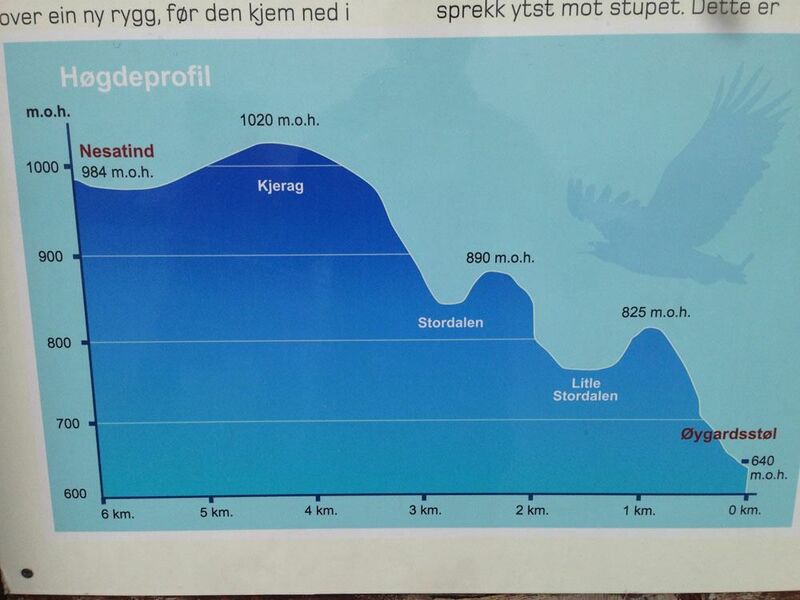 Please note, weather conditions can vary dramatically between Stavanger and Kjeragbolten. Just because it is raining in Stavanger it doesn’t mean that it will also be raining at Kjerag (or vice versa). We drove in and out of rain showers to get to the start of hike and we questioned if we should even be making the drive out to Kjeragbolten. Well, I am glad we did. Right at noon the rain stopped, the clouds disappeared, and we made one of our best travel memories ever. However, if you arrive at the car park and it is rainy or foggy, do not attempt this hike. There are reports every year of people losing their way in the fog and then needing to be rescued. Don’t be one of these people. Lysebotn is the closest town. There are a few bed and breakfast options in town. Stavanger. This is a much farther drive (2.5 hours) but there are many places to stay as well as a bunch of great restaurants for dining. Stavanger is a charming town to walk through. This is the perfect place to hike to Pulpit Rock and there is an airport here, connecting you to Oslo and the rest of Norway. 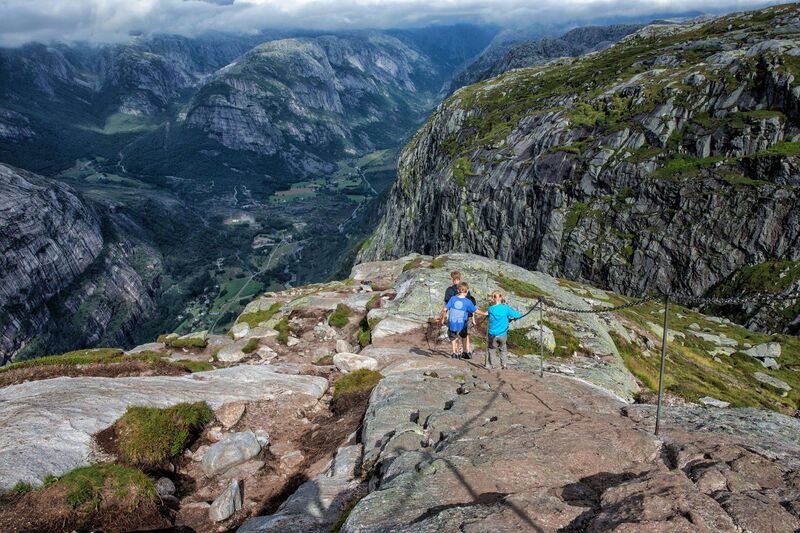 Is this hike on your list of things to do in Norway? 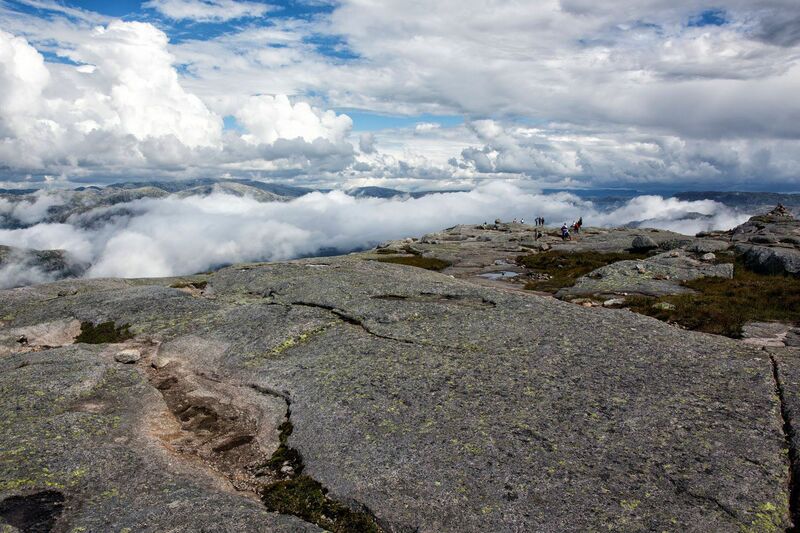 Comment below if you have any questions about hiking to Kjeragbolten. Thanks so much for the great information. We will be traveling to Kjeragbolten this August for some hiking and with your information I`m sure our trip will be very interesting !! Gives me confidence if your kids can do this, I can surely do it.